A snapshot from Digital Frog's website. Rancho Verde High School joined the Animal Welfare Institute's "Race to Stop Dissections" challenge, becoming the first school in the country to receive a software suite from the company. Dissecting dead frogs to study anatomy will end this semester at a Moreno Valley High School, which has chosen to use computer programs to simulate lab experiments -- a practice being applauded by an animal rights group. 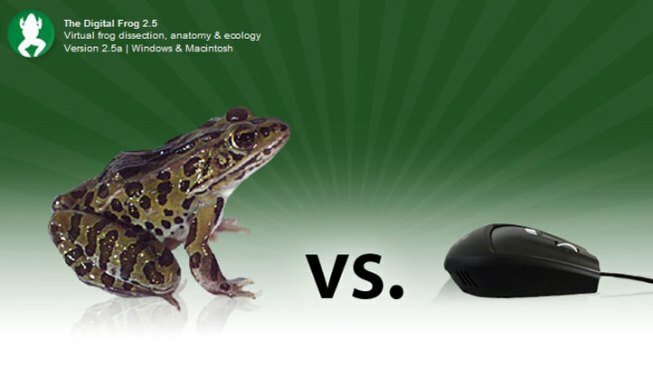 Rancho Verde High School joined the Animal Welfare Institute's "Race to Stop Dissections" challenge, becoming the first school in the country to receive a software suite from Digital Frog International, which is partnering with AWI, according to the Washington, D.C.-based nonprofit. In return for its commitment to stop dissections, Rancho Verde was awarded DFI's Digital Frog 2.5, a program that offers students the experience of a virtual dissection. "AWI commends Rancho Verde High School for abandoning its dissection program and using dissection alternatives to teach biology," said AWI President Cathy Liss. "This type of animal-friendly education is more humane, more effective, environmentally friendly, cost-effective and does not teach students to rationalize the unjustified killing of animals," she said. According to Val Verde Unified School District spokesman Dan Whitfield, Rancho Verde's decision was as much rooted in "dollars and cents" as anything else. "It helps eliminate the cost of using frog kits," Whitfield told City News Service. "Thirty traditional kits would serve only 300 students for $6,800." He said the chemicals used to preserve frog specimens are toxic and require careful handling -- something teachers don't have to worry about with software. On her website ZooMomScience.com, biology teacher Laura Roberts acknowledged that hands-on dissections are not always necessary but do have "many benefits." "Pictures of frog dissection cannot replace a real-life experience," she said. "A hands-on lab allows a student to understand the true positioning and feel for organs that just can't be expressed in the flat format of a computer monitor." She said dissections can also bring about a greater "respect for life." "This is the perfect time for young people to understand that there is much to learn about the creatures around us, and that they depend upon us for proper care and protection," Roberts said. According to AWI, the process of catching and killing frogs for lab studies "causes unnecessary suffering and death." Frog populations are dwindling, threatening wetland habitats in North America and elsewhere, according to the organization.